The purpose of this manual is to assist coastal managers and field workers with local control and research efforts for invasive lionfish. This project would not have been possible without the support of NOAA, REEF, ICRI, United Nations Environment Programme, Caribbean Environment Programme, SPAW-RAC, and the over 40 participants of the 2010 Caribbean Regional Lionfish Workshop. We are grateful to the translators Miguel Sales Figueroa and Georgina Bustamante, and the National Fish and Wildlife Foundation for funding support for the Spanish printing and distribution. We are especially grateful to GCFI for allowing this book to be the first in the new GCFI Special Publication Series. Chapter authors include James Morris (NOAA), Dayne Buddo (University of the West Indies, Jamaica), Stephanie Green (Simon Fraser University), Ricardo Gomez-Lozano (CONANP, Mexico), and Lad Akins (REEF). The introduction of lionfish into the Atlantic Ocean is now recognized as one of the major ecological disasters of the last two decades. Today lionfish are found in nearly all marine-habitat types along the Southeast United States, Gulf of Mexico, and Caribbean. Densities of lionfish have surpassed some native reef fish in many locations. The ecological impacts of this invasion are far-reaching — from disruptions to the structure and function of reef communities to impacts on commercial fishing and the tourism industry. 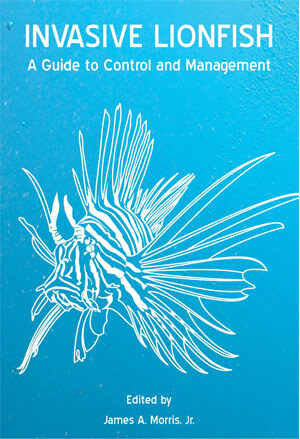 Invasive Lionfish: A Guide to Control and Management provides best practices for lionfish control and management, including control strategies, outreach and education, research, monitoring, legal considerations, and ideas for securing resources and partnerships. By following these best practices, resource managers can reduce the local impacts of invasive lionfish in marine protected areas and other places of ecological and economic importance. — Mark A. Hixon Professor of Marine Ecology and Conservation Biology, Oregon State University. — Alfredo Arellano Guillermo, Director General de Conservación para el Desarrollo, Comisión Nacional de Áreas Naturales Protegidas (CONANP) México. To view/download a free copy please download the pdf file attached. You can also visit: http://lionfish.gcfi.org/manual/.